The new U.S. visa rules will punish the wrong people. 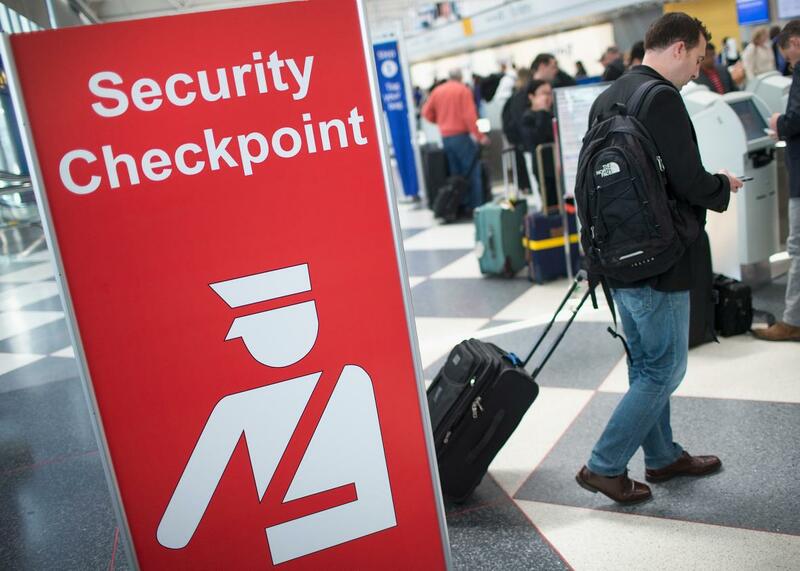 A sign directs travelers to a security checkpoint staffed by Transportation Security Administration workers at O’Hare Airport on June 2, 2015, in Chicago. The past week has seen both celebrations over the return to the U.S. of four Iranian-Americans—at least two of whom have dual citizenship—from Iranian prison, and outrage over a British journalist and her daughter being barred from entering the United States because of her dual Iranian nationality. The BBC’s Rana Rahimpour was prevented from entering the United States to visit relatives because of new visa waiver laws going into effect this week. Under the new rules, European, Japanese, and Australian travellers—who’ve previously enjoyed visa-free travel to the U.S.— must now apply for a visa if they’ve visited Iran, Iraq, or Sudan, the three countries on the State Department’s State Sponsors of Terrorism list. Dual citizens of any of those three countries also must now apply for a visa. The law, passed quickly in the wake of the Paris and San Bernardino, California, attacks, seems to have been implemented somewhat haphazardly. In her account of the incident, Rahimpour claims to have checked with the U.S. Embassy in London and received no information about when the new rules were going into effect. There are also concerns that the law could lead to difficulties for American travelers, if European governments take reciprocal measures. On the other side, Republicans have complained about a letter sent by John Kerry to his Iranian counterpart Javad Zarif, assuring him that the new rule could be waived. All of this leads to the presumption that this was a half-baked idea rushed through in an effort by both the White House and Congress to appear to be doing something productive in the wake of the attacks. While the rule does not affect American citizens, dual or otherwise, Iranian-American groups have protested the change, arguing that it’s discriminatory and will unduly burden Iranian diaspora families and businesses. In a joint editorial, the 28 EU ambassadors to the United States this week wrote that the rule is more likely to effect people engaged in business, journalism, or humanitarian work in these three countries than anyone who poses a security threat. Ironically, many of those in the population most impacted by the new rules—dual Iranian citizens living outside of Iran—are likely among those most critical of the country’s current government. This week’s treatment of a reporter from the BBC, an outlet frequently targeted with harassment and suppression by the Iranian authorities, is particularly unfortunate. Another problem with the new rules is the reliance on the “State Sponsors of Terrorism” list, a crude and outdated tool. As Cuba’s inclusion until last year demonstrates, the list has more to do with the government in question’s relationship to the United States than the security risk posed by its citizens. The jihadist attacks that have taken place in the U.S. in recent years were not been carried out by government agents and the most recent one was perpetrated by a couple with roots in Saudi Arabia and Pakistan—two key U.S. allies not impacted by the change. The law is a non sequitur.